The CO2 Gas sensor BT24i is used to monitor gaseous carbon dioxide levels in the range of 0 to 5000 ppm. The sensor uses the Non-Dispersive Infrared Detection (NDIR) method and detects the net increase or decrease of light that occurs at the wavelength where absorption of carbon dioxide takes place. The light intensity is then correlated to CO2 concentrations. CO2 gas moves in and out of the sensor tube by diffusion through the six vent holes in the sensor tube. The tube contains an infrared source at one end of the sensor tube and an infrared detector at the other end. The detector measures infrared radiation absorbed in a narrow band centered at 4.26 µm. The greater the concentration of the absorbing gas in the sampling tube, the less radiation is detected by the IR detector. When the sensor is collecting data, the IR source blinking on and off – it takes a reading about every 5 seconds. 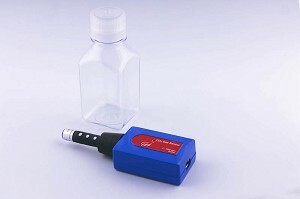 The sensor is delivered with a 250 ml sampling bottle and rubber stopper to attach the gas-sampling bottle to the sensor tube. Do not place the sensor tube directly into any liquid. The sensor is intended only for measuring gaseous, not aqueous, CO2 concentrations. • Measuring CO2 levels (respiration) from small animals and insects. • Monitoring CO2 changes in a plant terrarium during photorespiration and photosynthesis in light/dark (combination with the light sensor). • Measuring CO2 levels during cellular respiration of peas or beans. • Monitoring production of CO2 during chemical reactions. • Measuring CO2 levels in classrooms. The CO2 Gas sensor can be directly connected to analog BT inputs of the CMA interfaces.